Vic Simms is a Bidjigal man. His birth name is William Victor Simms. 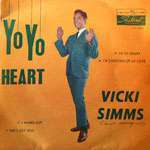 This is a very rare album of Vic Simms. "Australia's great lost classic album of black protest music." 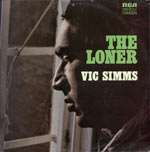 The Loner story: In 1973 Vic Simms was 26 years old and mid-way into a seven year sentence in Bathurst Jail for robbery. In jail he had bought an acoustic guitar for two packets of cigarettes, learned to play chords and started to write songs about his life and the injustices he saw around him. Representatives of a charity group heard Simms singing in the prison yard and took a cassette of his songs to record company RCA. The company brought in a mobile studio and recorded ten of Simms' original songs in a single one hour session. Initially, Simms' music enabled him to sing his way out of Bathurst Jail. He was one of the first indigenous performers to sing at the Sydney Opera House and went on the prison circuit singing for other inmates. Offended by the patronising attitudes of both RCA and the NSW department, Simms struck out on his own when he was released from prison in 1977. The original LP is exceedingly rare and few copies are known to exist. It sells for over U$100 at actions.